My face skin is a total nightmare. It is the worst combination of dry and oily skins, and very sensitive. My dermatologist suggested me to use face spray or face mist as it sometime goes too dry. I remember that my first face spray was Avene Thermal Spring Water. It is a good face spray product, but it doesn’t really solve my problem. I then tried Evian Brumisateur Facial Spray, which is cheaper than Avene. It is not bad at all, but again, it doesn’t help my case. These two products make my skin feels sticky and don’t really work with my makeup. I then stopped using any kind of face spray products. A month ago, I visited Shu Uemura to refill my compact and spotted the blue bottle of Depsea Water Facial Mist. The sales girl explained to me about it in a very convincing way. I doubted 80% of her words but was willing to give it a try. There are actually 9 options for the scent, but unfortunately the boutique I visited only had 3 variances and I opted for Lavender. I use the product daily; before applying my SKII face serum and morning cream, after applying my makeup, before applying my night cream, and several times during the day. The texture of this facial mist is very fine and covers most of the skin easily. It doesn’t make your skin sticky at all. You don’t have to worry about the scent because it is not overwhelming, totally pleasant and goes away quickly. After using it for more than a month, I have to say that this product is amazing! It doesn’t only help to refresh my skin, but also to moisturize it. I am no longer experiencing any dryness after my skin treatment. Well, I bet people with acne-prone skin mostly experience a condition in which the products they use to overcome the breakouts and pimple all are drying on their skins. So this product is the best solution to help your skin feels less irritated. In addition, it helps smooth out some roughness in my face and works really well with my makeup. I thought they put some magic in its ingredient, but of course not! (Soz, not funny!) The ingredients of this lovely product are Maris Aqua, Methylparaben, Linalool, and Fragrance. 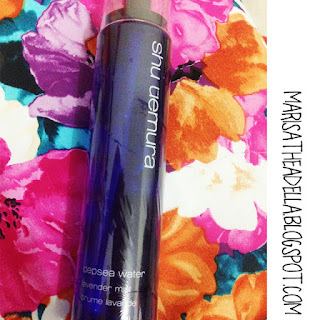 Shu Uemura claimed that the seawater is taken from great depths with over 60 minerals- meaning to say, it is the purest, most stable water on earth. I know I shouldn’t believe in those kinds of advertisement word, but I did. Just incase you want to prove the magic of the product by yourself, please visit the nearest Shu Uemura official outlet or boutique. Depsea Water Facial Mist is a little bit pricey- just like the rest of the company’s products. It costs 340,000IDR for a bottle of 150ml Depsea Water, but it’s worth every penny!